Here are some snazzy birthday facts about 14th of October 1985 that no one tells you about. Don’t wait a minute longer and jump in using the content links below. Average read time of 10 minutes. Enjoy! What day was my birthday Oct 14, 1985? October 14, 1985 was a Monday and it was the 287th day of the year 1985. It was the 41st Monday of that year. The next time you can reuse your old 1985 calendar will be in 2019. Both calendars will be exactly the same! This is assuming you are not interested in the dates for Easter and other irregular holidays that are based on a lunisolar calendar. There are 178 days left before your next birthday. You will be 34 years old when that day comes. There have been 12,240 days from the day you were born up to today. If you’ve been sleeping 8 hours daily since birth, then you have slept a total of 4,080 days or 11.17 years. You spent 33% of your life sleeping. Since night and day always follow each other, there were precisely 414 full moons after you were born up to this day. How many of them did you see? The next full moon that you can see will be on April 19 at 11:14:00 GMT – Friday. Fun stat: Your first one billion seconds (1,000,000,000) happened sometime on June 22, 2017. If a dog named Candence - a Belgian Malinois breed, was born on the same date as you then it will be 193 dog years old today. A dog’s first human year is equal to 15 dog years. Dogs age differently depending on breed and size. When you reach the age of 6 Candence will be 45 dog years old. From that point forward a large-sized dog like Candence will age 5-6 dog years for every human year. Work on London’s Regent’s Canal starts. Senghenydd Colliery Disaster, the United Kingdom’s worst coal mining accident, occurs, and it claims the lives of 439 miners. The American Atomic Energy Commission, with supporting military units, carries out an underground nuclear weapon test at the Nevada Test Site, just north of Las Vegas. Vietnam War: The United States Department of Defense announces that the U.S. Army and U.S. Marine Corps will send about 24,000 soldiers and Marines back to Vietnam for involuntary second tours of duty in the combat zone there. In the Thammasat student uprising over 100,000 people protest in Thailand against the Thanom military government, 77 are killed and 857 are injured by soldiers. The Palestinian leader, Yasser Arafat, The Prime Minister of Israel, Yitzhak Rabin, and the Foreign Minister of Israel, Shimon Peres, receive the Nobel Peace Prize for their role in the establishment of the Oslo Accords and the framing of the future Palestinian Self Government. What does my birthday October 14, 1985 mean? Your birthday numbers 10, 14, and 1985 reveal that your Life Path number is 11. It is a master number that represents intuition, idealism and invention. You have the potential to be a source of inspiration and illumination for people. The following celebrities also have the same life path number: Nicole Fox, Stevie Lynn Jones, Lionel Blair, Yosi Piamenta, James Duval, Colbie Caillat, Lori Alan, Charlie Tumahai, Margaret Anglin, J. B. Lenoir. 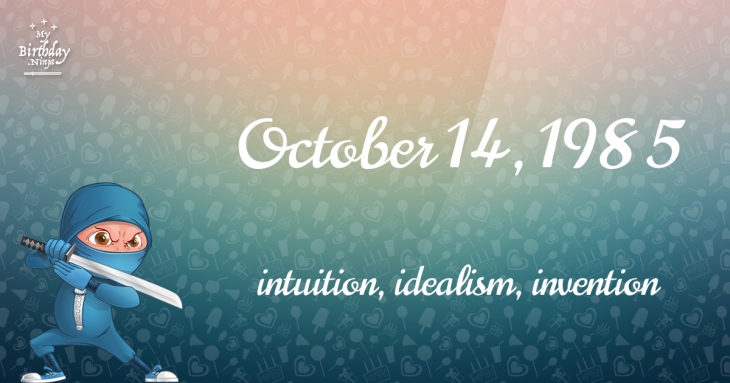 What is the birthday horoscope for Oct 14, 1985? The Western zodiac or sun sign of a person born on October 14 is Libra ♎ (The Scales) – a cardinal sign with Air as Western element. The ruling planet is Venus – the planet of love and beauty. According to the ancient art of Chinese astrology (or Eastern zodiac), Ox is the mythical animal and Wood is the Eastern element of a person born on October 14, 1985. Fun fact: The birth flower for 14th October 1985 is Cosmos for constancy. The number-one hit song in the U.S. at the day of your birth was Take on Me by a-ha as compiled by Billboard Hot 100 (October 19, 1985). Ask your parents if they know this popular song. How many babies were born on October 14, 1985? Base on the data published by the United Nations Population Division, an estimated 135,970,553 babies were born throughout the world in the year 1985. The estimated number of babies born on 14th October 1985 is 372,522. That’s equivalent to 259 babies every minute. Try to imagine if all of them are crying at the same time. What is the popular baby name on 14 Oct 1985? Here’s a quick list of all the fun birthday facts about October 14, 1985. Celebrities, famous birthdays, historical events, and past life were excluded. 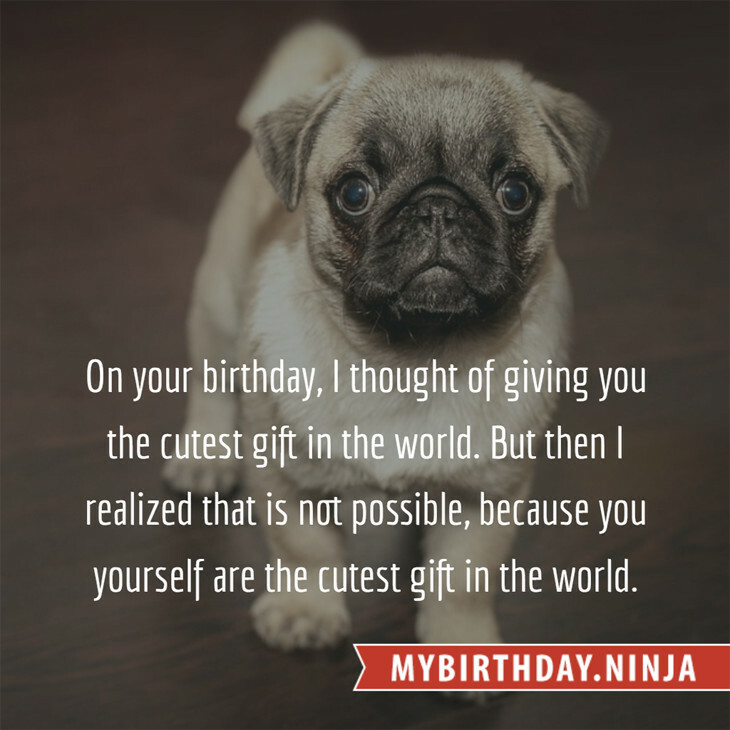 Try another birth date of someone you know or try the birthday of these celebrities: March 28, 1957 – Paul Eiding, American actor; March 31, 1961 – Howard Gordon, American screenwriter and producer; July 26, 1980 – Lee Dong-gun, South Korean actor and singer.